"Excellent teaching standards and how well the teachers fed back to us at parents evening"
"The Maths and English lessons that parents could attend were great. It was especially lovely to have lunch with my son and see him in his school environment, he really enjoyed it too!" "The standard of teaching has been brilliant and has exceeded our expectations across all subjects"
"Progress in maths and developing a mature attitude towards work"
"The opportunity to develop their sporting ability"
"My son is clearly inspired and motivated by his teachers"
"The efficiency of parents evening and increased opportunity for parents evenings"
"The Enrichment Project is an excellent initiative and enjoyed by my daughter"
"The relationship between staff and pupils"
"I am really pleased with my son attending Show Racism the Red Card"
"3 way partnership between school, child and parents"
"The way my child is challenged in her subjects which has increased her interest, enjoyment and engagement"
"Very pleased with the overall standards in the whole school. Keep up the excellent work!" "We appreciate all you do for our children, especially attention paid to details like allergies and medications"
"My child has continued to thrive this year both socially and academically. He is confident, happy and feels safe. I think very highly of this school." "Love the green pen work and the fact that my child loves to get comments back and does not feel in any way that this represents a failure"
"I think the school has lots of exciting opportunities with the enrichment project, sporting events etc." 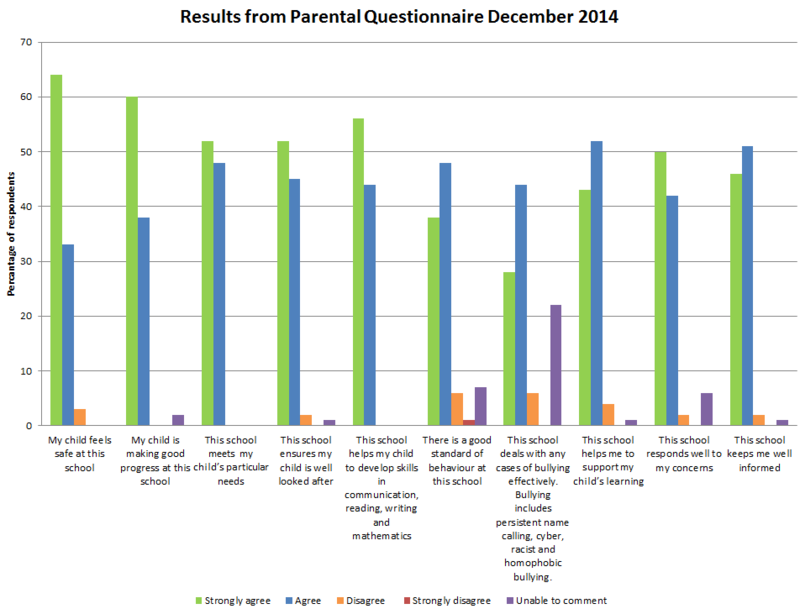 In December 2014 the school sent out a questionnaire to parents/carers asking for views on a number of areas. Below are the results of the questionnaire; There were 180 questionnaires returned from a possible 294 students. Thank you for taking the time to share your views which are very important to us as a school, to help us improve and provide the best possible education for your children. We are extremely pleased with the results (and your comments above) as it shows how much progress the school has made in the last year to engage with parents and give our pupils the best possible opportunities to succeed. We recognise that there is still more to do and as a committed team of professionals we aim, with your help, to make further improvement. This school deals with any cases of bullying effectively. Bullying includes persistent name calling, cyber, racist and homophobic bullying.